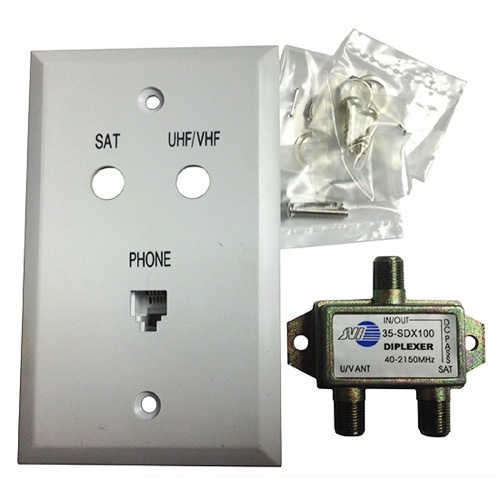 The mini Diplexer with Wall Plate & Phone Jack combined with a custom Wall plate. This allows the installer a neat solution for a more professional installation. Allows off-air (UHF/VHF) or CATV and satellite (DSS) IF signals to be diplexed (combined) into one cable run to receiver and is mounted with a wall plate and telephone jack for ultra convenience and ease of installation. Allows off-air and satellite signals to be fed on a single coax. DC power pass provided from the IRD to the LNB. Use second unit to split the signals from the single coax cable run into the individual inputs needed for the receiver. Saves labor and cable costs!